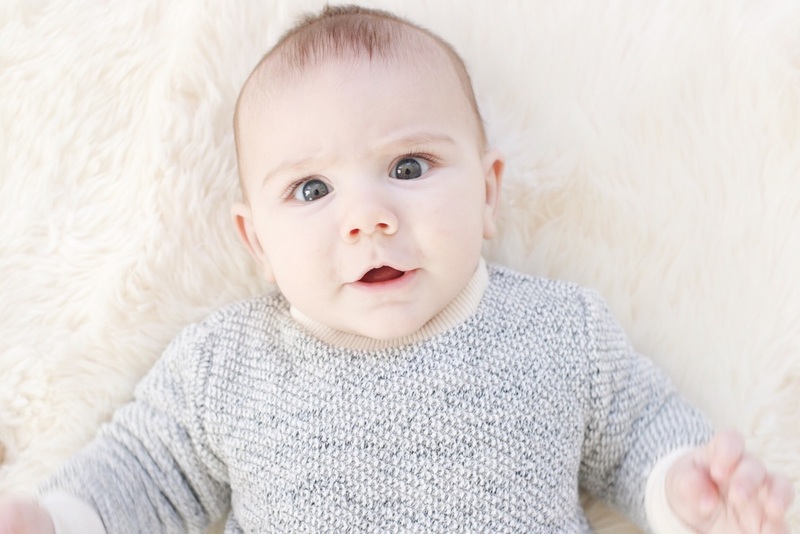 I held him in my arms as we rocked back and forth, back and forth in the dove grey glider I bought as the first piece of furniture for his nursery. We gave him a bath last night and I could still smell the faint scent of baby shampoo on his forehead which was inches away from my nose as he nursed his way to a deep slumber. I stared at the pattern of his medium brown hair growing on his head, swearing that if I stared long enough I'd see another hair sprout up. He's growing so quickly, I thought. It's a phrase I hear myself think so often that it would begin to lose its meaning if it wasn't the most true thing I could say these days. I listened to his half gulps as they began to slow as he drifted off. I felt his hand on me, pressing into me, making sure I was there and making sure that he was safe. And I tasted a tear as it rolled down my cheek. Nowadays, I cry out of happiness far more than out of sadness. It's a heart-wrenching, devastatingly beautiful thing to watch this boy grow. Some days I feel like I'm instrumental in his growth and other days I feel like I'm just along for the ride. But either way, I couldn't be more honored to be a part of Noam's world. Noam is continuing to grow quickly. He's around 18 pounds and in 6-9 and 6-12 month clothing, size 3 and sometimes 4 diapers and showing no signs of slowing down. He's such a big boy, I often find myself comparing him in size to babies many months older than him. I've found there's a great fringe benefit to having a baby who grows this quickly: he outgrows his clothing so quickly I find myself needing to go shopping more often! I guess I can deal with that. Noam is still exclusively breastfed and, as I mentioned in my last update on him, I plan to breastfeed as long as he'll take it. Though I do very much look forward to beginning to introduce solids to him after he turns 6 months old. I'm mostly interested in seeing how he reacts to something so different from what he's known for his entire life and which foods he likes most. I nurse him on demand, but it turns out to be every 3-4 hours throughout the day and sometimes more often at night. Last update, I said I was considering removing this section. But I think it's important (for any moms or moms-to-be reading this) to paint a realistic picture of what infant sleep is actually like. I've read so much about what's typical, what's healthy and what's expected and, after doing so, feel incredibly comfortable and satisfied with how Noam sleeps. He wakes several times at night to nurse but, because we bed-share and he's right next to me, his wakings are minimal and often times I sleep right through them. He goes right back to sleep as soon as he nurses and rarely cries or fusses when he wakes. I love our arrangement but sometimes wish there were a size up from a king size bed. It's really an indescribable feeling to watch Noam develop as much as he has already. Literally every day is something new. He's now more present than ever before - interacting and responding to us, to others and to the world around him. He finds things funny or amusing or entertaining and makes it clear that he does with a scream or a belly chuckle or a lunge toward something. Noam speaks constantly and always makes it known what he thinks. He babbles first thing in the morning as he stares at the light peeking through the window shades and smiles his biggest smile when he sees that I'm awake with him. He'll often scream if he finds something particularly interesting or frustrating and it makes me think this baby will grow into a fearless child ready to speak his mind. Noam loves music and interacts with his toys on a completely different level at this point. He pushes buttons and presses on things with a seemingly decent understanding of cause and effect. He's begun to sit up unassisted and can stay up for extended periods of time now. When he inevitably topples over, it's in a slow-motion-like way and kind of fascinating to watch. He's rolled from back to belly and belly to back several times on his own but doesn't seem as interested in doing that as he is in sitting up. He's developing abs of steel with the crunch-like position he often attempts while laying down. He's also begun reaching for things - toys, us, and his favorite - the dogs - and has quite a pincher grasp. Finally, Noam has been teething for a while and began cutting his two bottom teeth. The tops of those pearly whites are showing and razor sharp - fingers beware! Maybe it's because he kind of has this cherubic quality or because I'm projecting onto him but Noam seems like just the sweetest baby I've ever met. He's such a snuggle bug cuddle bunny (you know the kind, right?) and gives the biggest smile and warmest glances. Finally, I can't help but feel like Noam is a bit of an old soul. He's fascinated by the world around him and will do things like touch my face as if he's discovering it and studying it and charting a map of it to make sure he can always get back to it when he needs to. It gives me hope that he understands his place here. That right now it's here. He craves attention and constant contact and all of the love you can give and I think it's because, on some level, somehow, he understands just how big this world and just how little he is and just how much he is loved.